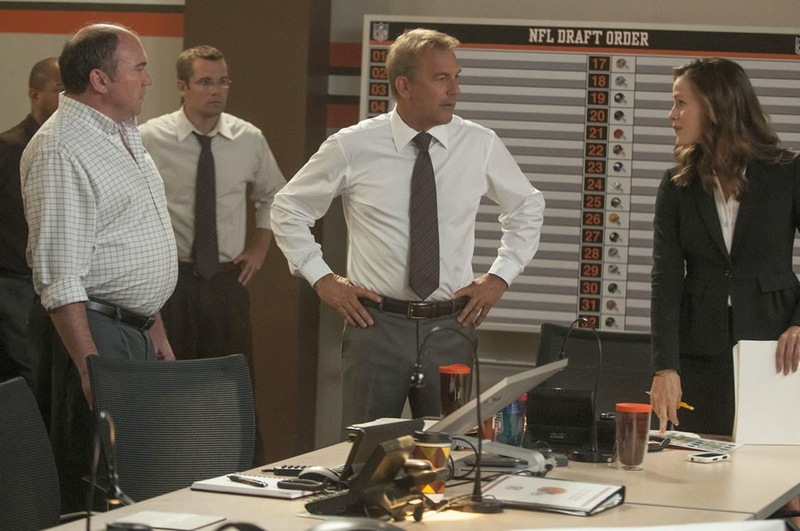 Director Ivan Reitman's new film does for football what Moneyball did for baseball. Except it doesn't have Brad or Jonah, instead it has Kevin Costner and Jennifer Garner. 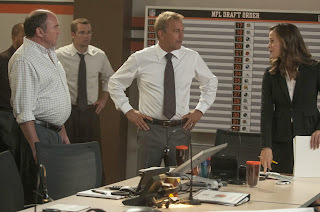 Writers Scott Rothman and Rajiv Joseph center on the behind the scenes shenanigans of the Cleveland Brown General Manager as he attempts to acquire the desired players for this team through the annual draft picks. For football fans it's an interesting look at the dialogue heavy manipulations that are necessary to jockey for key players and for women, there is Kevin and his romance with the capable lawyer girlfriend played by Jennifer. Sonny Weaver, Jr. (Kevin Costner) was the son of the legendary coach for the Cleveland Browns, but earned the city's scorn when he fired him. Sonny has a particular vision for the team and he will do most anything to make that happen. He manages to get the first pick of the day, but at the expense of their first round picks for the next three years. The “next big thing” Bo Callahan (Josh Pence) is everyone's number one draft pick. The Browns Owner Harvey Molina (Frank Langella) is putting the pressure on Sonny to get Bo, because of the excitement behind the college player and the fans it will fill the stadium. The Browns have been on a thirteen year losing streak and Sonny has to be sure he will be the right fit, at the gamble of losing his job. The current quarterback Brian Drew (Tom Welling) has been working his way back after an injury that sidelined him. Ray Jennings (Arian Foster) and Vontae Mack (Chadwick Boseman) thought they had a shot of being an early round pick. Not to mention his coach team who bicker about what he should do. The events in the movie occur all in one day starting with Sonny's girlfriend and the Brown's business lawyer Ali (Jennifer Garner) informing him that she's pregnant. He's got this in the back of his mind while he's juggling calls to other GM's wheeling and dealing for position in the draft that is supposed to occur later that evening. He's also investigating Bo because his instincts tell him that he may be too good to be true. At the same time, he's got to figure out how to build his dream team despite his boss jumping the gun and announcing that Bo will be a Cleveland Brown. The action runs quickly and there's an emotional element as Costner has to side step and listen to everyone's point of view without losing track of his own. Even his mother (Ellen Burstyn) calls him with her opinions. Costner has good timing with the comedic elements of the story letting most of it come from the other characters. Garner, still playing the girlfriend role, manages to give Ali a little grit and backbone. If you love sports and even if you don't like sports, it's an interesting look on how players are bartered and traded between teams. And it's great to have Costner back in the driving seat.